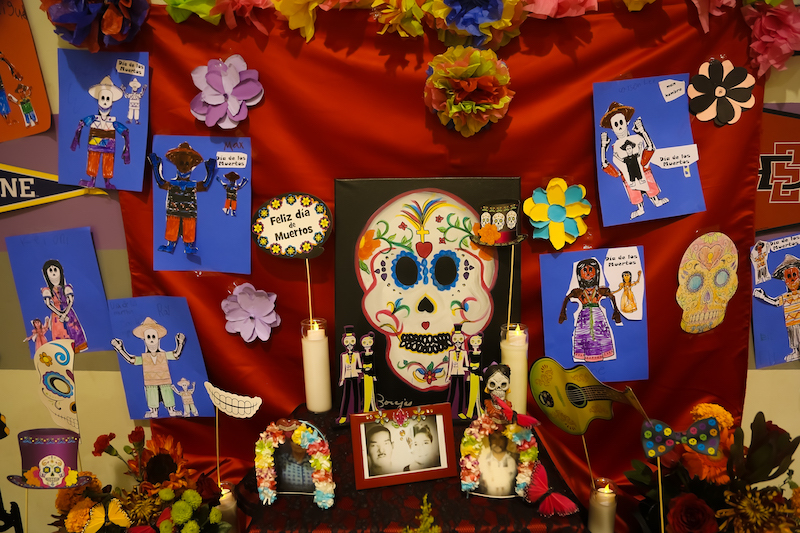 For some students at Denair Elementary Charter Academy, Dia de los Muertos (Day of the Dead) already is an important part of their family culture. 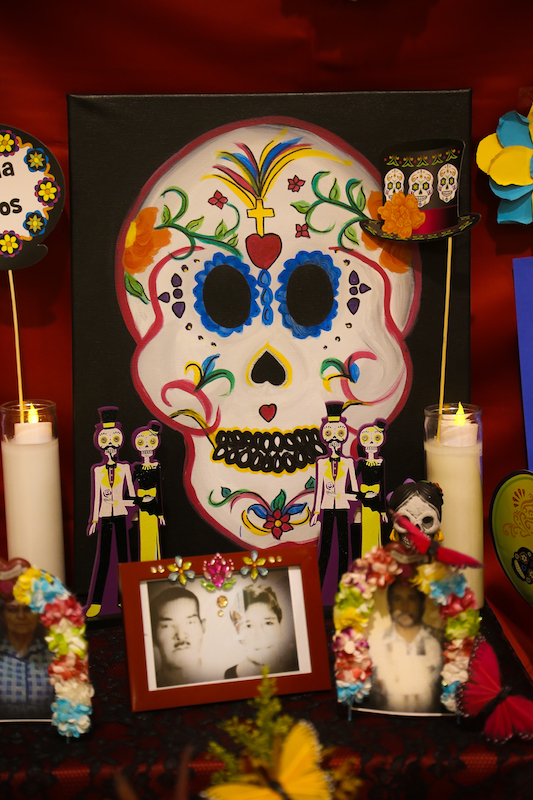 For hundreds of years , it has been a time for Latinos to honor friends and relatives who have passed away. But for non-Latino DECA students, Wednesday was a learning experience, an opportunity to understand how others remember and celebrate loved ones who are no longer alive. 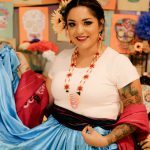 Dia de los Muertos occurs Nov. 1-2 each year. 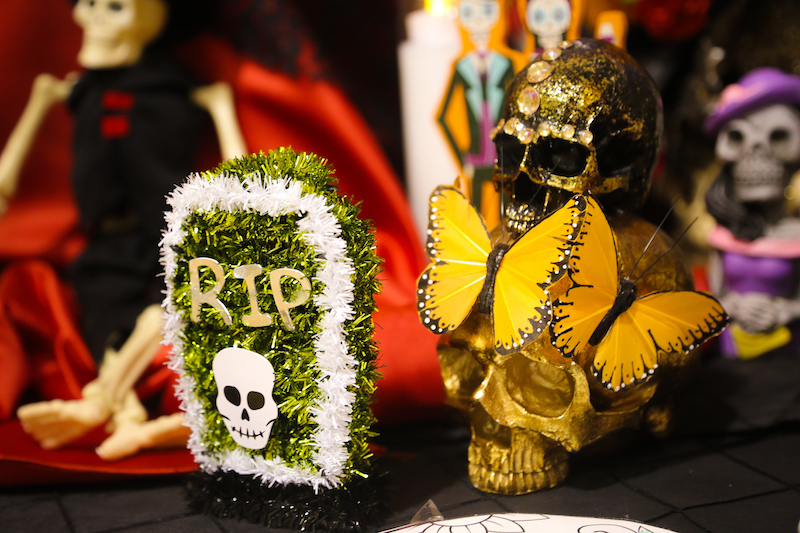 Though the timing is close, it is not the Latin version of Halloween. 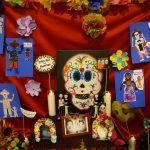 Artistic skulls often are part of the altars created at home or at cemeteries, but Dia de los Muertes is about family, not candy. 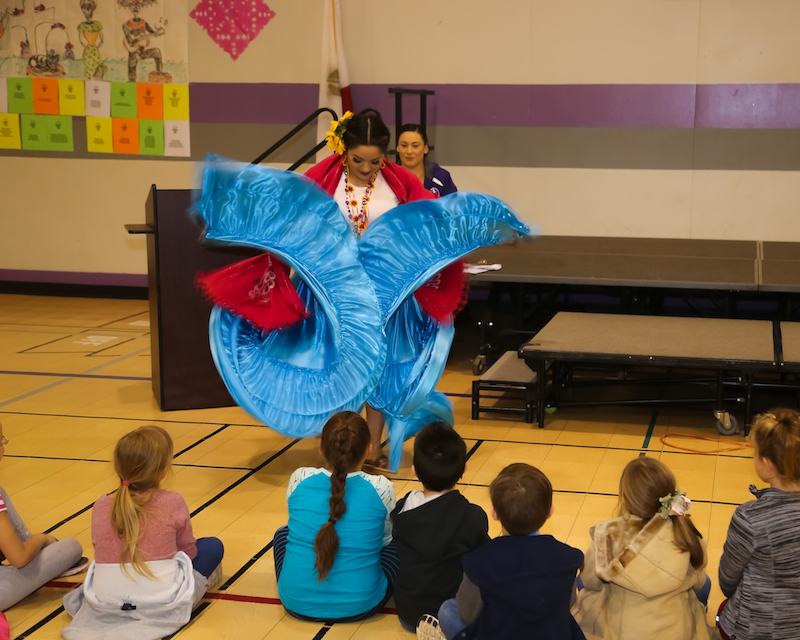 “It’s a way to show love and respect for one’s ancestors,” said Bibiana Alonzo Sandoval, DECA’s Spanish language lab instructor and one of the coordinators of Wednesday’s event. 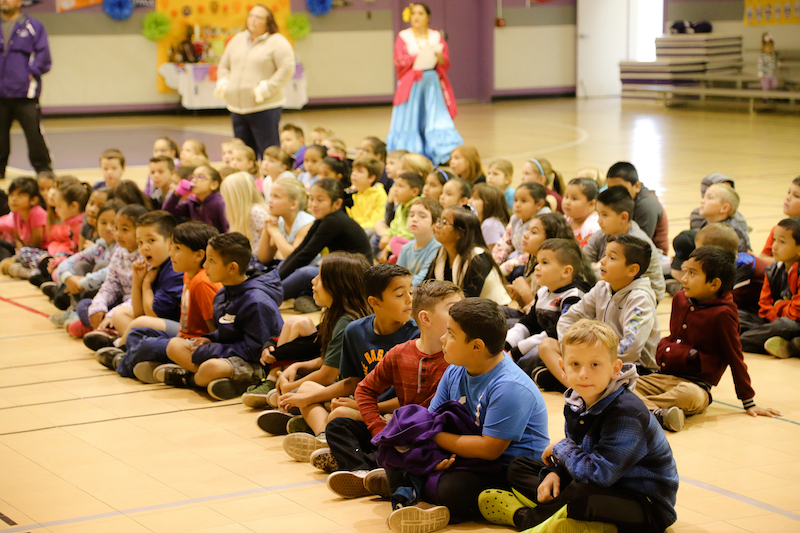 More than 500 kindergarten through fifth-graders were ushered into the DECA gym during the time they typically had either a physical education period or their twice-weekly Spanish class. 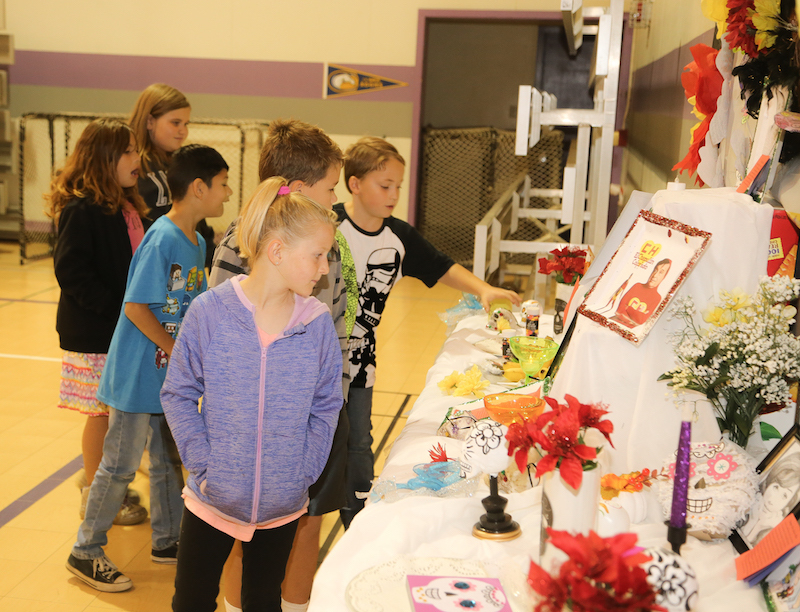 In the gym, teachers spoke about Dia de los Muertos in English and Spanish as part of a Power Point presentation. 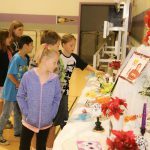 Five altars created by students were arrayed around the gym along with a mural of student artwork. Sandoval and DECA learning director Laura Cardenas led students from altar to altar, taking time to explain the significance what was on display. There were photos of grandparents and others being remembered, along with other traditional items like marigolds, candles, paper skulls, cookies and various decorations. 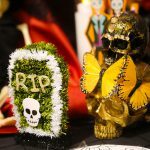 In many Latin American countries, children who have died are celebrated on Nov. 1 while adults are remembered on Nov. 2. 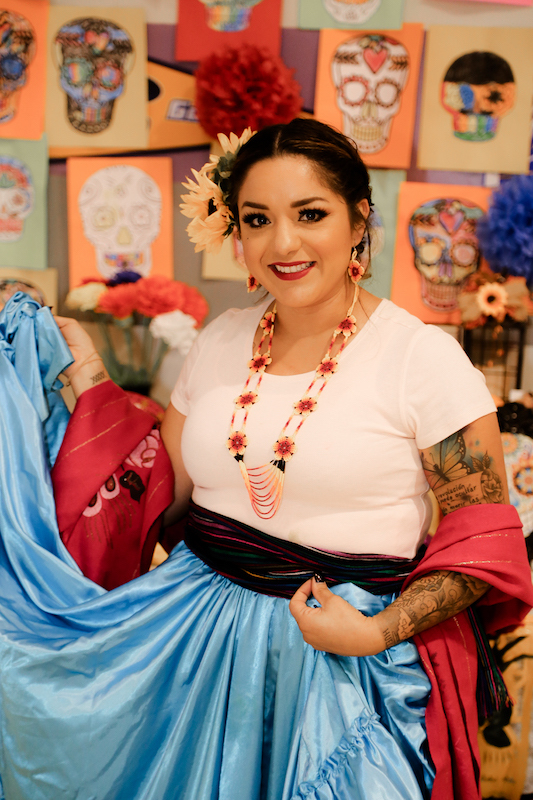 It is the second year that DECA has included Dia de los Muertos as part of its lessons across all grade levels. Testing procedures and analysis is about to go to a whole different level in the Denair Unified School District. The goal, school trustees were told Thursday night, is to better understand student performance in order to create customized plans to address specific academic weaknesses. Parents soon will be receiving reports that chart their children’s progress in four performance areas and include recommendations to help them improve. 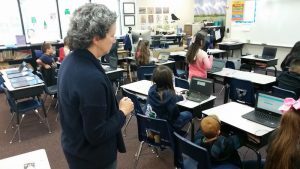 The testing program is part of the NWEA system, an international organization recognized for its student assessment systems. NWEA’s results provide the national averages to which Denair students from kindergarten through 11th grade were compared. The tests themselves cover four core subjects – math, reading, language usage and science. 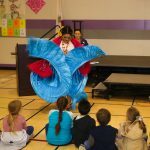 Each child is expected to complete them, including students in special education programs as well as those for whom English is a second language (starting this year, exams also will be given in Spanish). The tests are taken at the district’s various computer labs; each subject takes about 50 minutes to complete. The tests will be given three times a year, Naranjo explained, so performance can be measured and interventions introduced as necessary. The first tests were given in May. Those results were shared Thursday night. 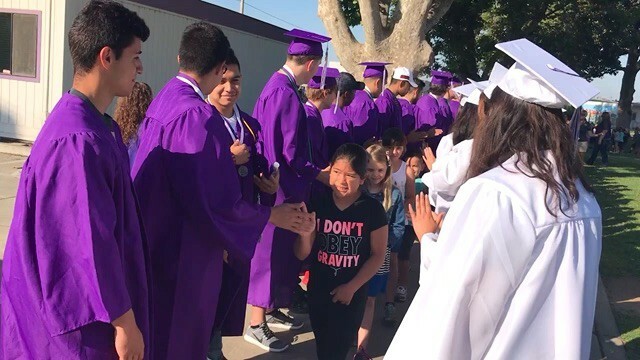 Denair Elementary Charter Academy has received recognition for its implementation of a national program that supports proper behavior by students on campus. DECA’s staff began staff training in 2015-16 for the tier 1 PBIS guidelines, which were implemented last school year. 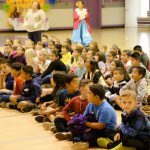 There was training last year for the second level of the PBIS program, which will begin when classes resume this week. And training will occur this year for the tier 3 guidelines to be implemented next fall. DECA is among hundreds of schools in California that follow the PBIS standards. In recognition, the campus received a bronze medal for 2016-17 from the California PBIS Coalition.